Ojas' First Shoot by Harsha K R. CC BY-SA 2.1. Every year, 135 million newborns enter the world, arriving naked and apparently equal. Yet, their chances of surviving and thriving vary dramatically depending on which world these babies are born into, ranging from high-income countries where most babies who need to can access neonatal intensive care, to the world of home births without midwives, medical supplies, or health system support. This article is adapted from: Lawn, JE, Blencowe, H, Darmstadt, GL & Bhutta, ZA. Beyond newborn survival: the world you are born into determines your risk of disability-free survival. Pediatr Res. 2013. The birth lottery: which world were you born into? Where you are born strongly affects your outcome, and you may be born into four very different worlds. Each year around 11 million babies are born in high-income countries where birth with a skilled attendant, emergency obstetric and neonatal intensive care are almost universally available. In these settings stillbirth and neonatal mortality rates are very low (less than 5 per 1,000 births), and attempts are made to actively treat even extremely preterm newborns. Survival is now at 80% for those born at 25 weeks gestational age, with disability risk very low for infants born beyond this threshold 2. 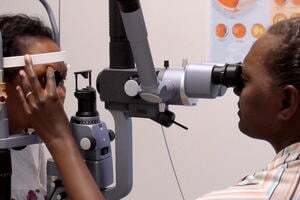 However, the risk of death and disability varies within and between high-income countries and is closely linked to the quality of care received. There are around 34 million babies born in middle-income countries annually, with the majority of these births taking place in hospitals with a skilled attendant and access to emergency obstetric care. Access to neonatal intensive care is not universal, and there is less assurance for quality of care through detailed protocols, e.g. safe oxygen use. Although neonatal mortality rates have dramatically reduced in many middle-income countries, with more than 50 countries halving their neonatal mortality rates in the past 2 decades3 disability rates have increased during the same time period, including in moderately preterm babies with preventable disabilities2,4. 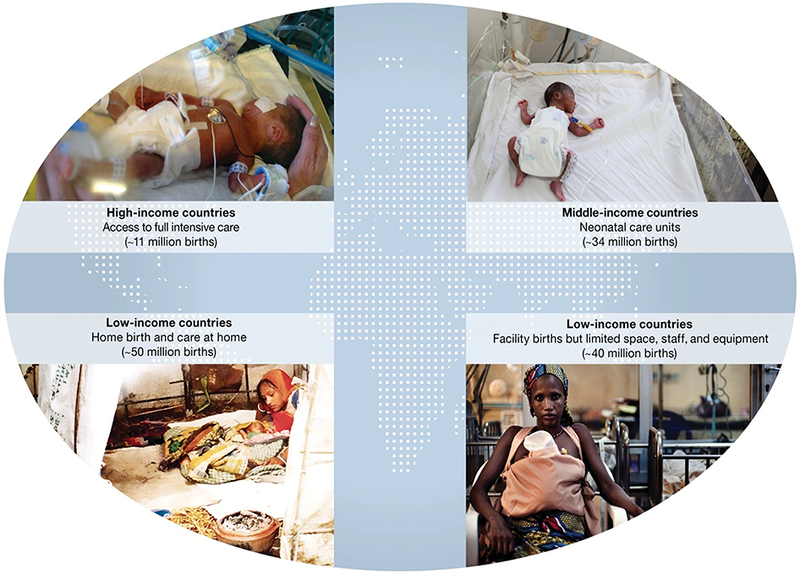 In low-income countries there has been a big shift towards facility births, with around 40 million births annually now occurring in facilities. Yet for both women and their babies the gap for quality of care, both effective and respectful, is critical. Disability outcomes are a clear marker of low quality care and are more obvious to society than a stillbirth or neonatal death. In the often invisible world of 50 million home births, most of the burden of disease is attributable to deaths rather than to disability, but here too these are mainly preventable. Which conditions around the time of birth have the highest risk of death and disability? 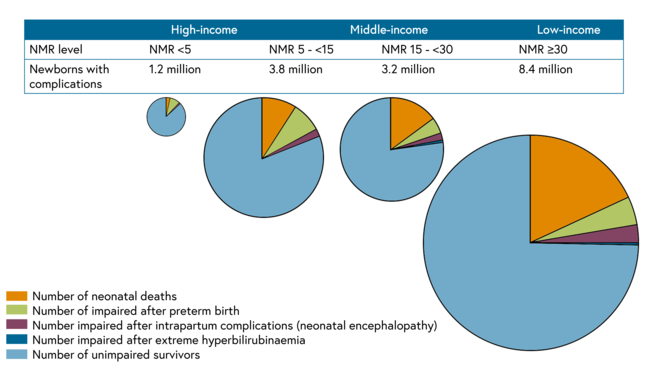 Overall the majority of newborns with life-threatening conditions, including preterm births, are in low- and middle-income countries (Figure 2). Where the burden is highest, death is still far more common than disability. However, in middle-income countries the burden of disability is similar to that of deaths, and the risk of disability is twice that of high-income countries. These disabilities differ by country. In high-income countries disability is especially driven by neonatal intensive care for extremely preterm (under 26 weeks gestation) babies, although disability-free survival has improved over the last two decades 8. In middle-income countries the most common disabilities are in moderately preterm babies and should be preventable with improved quality of childbirth and neonatal care. Urgent attention is needed to test and invest in simplified systems to track these babies and prevent or care for disability. Where are the biggest data gaps? Estimates are constrained by the data available, but we are now seeing the best attempt yet to combine all available data and map the size of the problem of neonatal morbidity. Current estimates are likely to underestimate the true global burden of the range of impairments and disabilities attributable to neonatal conditions because not all outcomes were covered, e.g. behavioural conditions. Data gaps are greatest in the poorest countries and worst for conditions that are now rare in rich countries, such as intra-partum complications and neonatal infections. This is in contrast with preterm birth which remains a substantial challenge in all regions globally, including high income countries such as the United States. Shockingly, there are almost no national data on neonatal hyperbilirubinemia available except from Denmark and Canada. Modeled estimates have therefore been undertaken using historical data from more than half a century ago 6. Improved estimates will require better data from all countries, especially the poorest countries, counting birth and development outcomes and using consistent definitions. 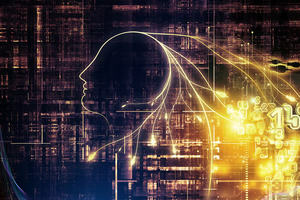 Better data and better use of existing data is fundamental. Countries, especially middle-income countries with growing intensive care services, urgently need to improve quality of care and the quality of follow-up data on child development, developing services for those with impairment 9. Neonatal conditions result in social and economic loss to families and nations. Investing in care of women and newborns will reduce both deaths and disabilities, but additionally help us move towards improving child development outcomes. Where does prevention of disability and improved child development fit post-2015? The Global Burden of Disease estimates that of all global disability-adjusted life years in 2015, more than 1 in 10 were due to neonatal or congenital conditions. Of this, 95% were estimated to be due to neonatal deaths rather than subsequent disability 10. This burden is more than three times that of HIV, more than all cancers, and similar to all cardiovascular conditions. This is increasingly being recognised as a public health priority 11. Now, with almost half of all under-five deaths occurring in the first month of life (the neonatal period), reducing neonatal deaths is rising to the top of the child survival agenda. However, neonatal morbidity and its long-term impacts have to date received almost no attention in many settings, and are increasingly important issues for individuals, families, and nations. This will be especially important as the focus shifts in the SDG-era, with more recognition given to disability-free survival, human capital, and wider sustainable development 12.